February 23rd, 2011 - Since the publication of the European Commission’s (EC) eHealth Action Plan in 2004, eHealth has gained significant momentum across Europe. "European countries on their journey towards national eHealth infrastructures - evidence of progress and recommendations for cooperative actions" is the title of a just released overview and synthesis report on eHealth in Europe. The EC sponsored eHealth Strategies study has pre-published an online version of this report, which is available at the study website. In addition, more than 30 individual reports detailing policy actions and deployment of eHealth applications in Member States and other European countries are available there as well. The summary report traces European countries’ progress along the goals set out in the eHealth Action Plan. It focuses on the core applications of EHR-like/patient summary and ePrescription systems. It also analyses governance, structural and legal issues as well as policy lifecycle aspects. Study results show that in virtually all European countries surveyed, political as well as stakeholder interest in eHealth policies, and the planning and implementation of national or regional infrastructures has gained great momentum. This concerns not so much the number of new priority objectives identified, infrastructure elements tackled or pilots run, but rather the overall level of awareness, activities and concrete undertakings. EC as well as Member State initiated activities and co-operations like epSOS or the eHealth Governance Initiative have both significantly contributed to this state of affairs and are witness thereof. As Pēteris Zilgalvis, Head of the EC’s ICT for Health Unit commented, "Europe is experiencing a strong political momentum to advance eHealth solutions for the benefit of both its citizens and health systems. The recommendations for further actions submitted in this study are based on a thorough analysis of eHealth strategies and implementation activities in European countries as well as the results of a validation workshop in September 2010 in Brussels. ... Now the challenge is to cooperatively address the issues identified." empirica Communication and Technology Research, with more than 20 years of experience in research on eHealth and telemedicine topics, coordinated the study. The Finnish partner institute THL (National Institute for Health and Welfare, legal specialists from the law firm Time.lex and Professor Denis Protti (University of Victoria, Canada), contributed domain expertise. The study’s communication efforts and final validation workshop were supported by the communication agency EMC Consulting Group. A host of experts as well as reviewers from the i2010 Subgroup on eHealth contributed their intimate knowledge of the eHealth situation in their respective countries and validated the content of the country reports. This comprehensive collection of country information constitutes a unique resource and important database of up to date evidence on eHealth progress across Europe, which updates and complements the results of the earlier eHealth ERA study of 2007. February 14, 2011 - empirica’s Senior Research Associate Dr. Karl Stroetmann presented an overview of the status quo and progress made on privacy and data protection issues in national eHealth strategies at this year’s Conference on Computers, Privacy & Data Protection (CPDP) which took place from January 25 to 27 in Brussels, Belgium. 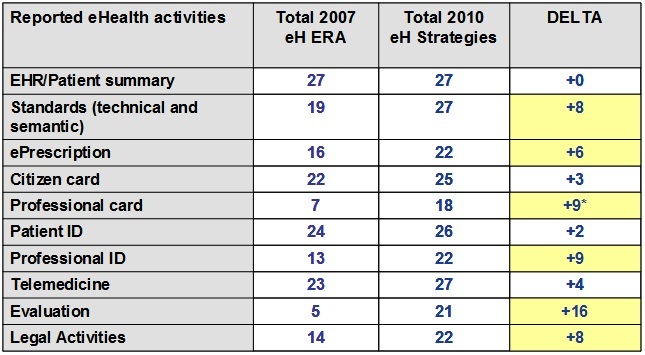 The eHealth Strategies project surveys and analyses national eHealth policies and the progress made in recent years. One of its foci is on eHealth related legal challenges in EU and EEA countries. Apart from outlining objectives and methodology of the overall initiative, Dr. Karl Stroetmann’s talk provided an overview of the situation across Europe concerning privacy issues and data protection. He also made recommendations for the improvement of legal frameworks and infrastructure at the international conference. In many countries the use of eHealth is currently regulated only by the general legal framework, in particular by laws on patient rights and data protection. New legislation is often still in the process of being enacted, but slowed down by the complex legislative process in various countries. Amongst the forerunners in designing a legal framework adapted to the use of eHealth are Denmark, England, Estonia, Finland, France, Norway, Scotland, Slovakia, Sweden. Almost all other countries dispose of some regulation on health data, if only through the transposition of article 8 of the EU Data Protection Directive. The aim of the CPDP 2011 is to create a bridge between policy makers, academics, practitioners and activists. At the three-day event they can exchange ideas and discuss emerging issues of information technology, privacy, data protection and law. This year’s ambitious agenda included twelve panels, a philosophical reading panel and a PhD-evening. In total more than 150 speakers contributed. September 28, 2010 - eHealth in Austria is facing similar challenges to those found in other European countries. Empirica expert Jörg Artmann has recently published an analysis of eHealth in Austria, based on the insights available from the eHealth Strategies study. The set-up of the competence centre ELGA plc and the adoption of IHE profiles are two examples that show how Austria is part of a larger European trend to formalise administrative structures and to adopt international standards. On legal issues, Austria has been a frontrunner, being the first country to have transposed European legislation on digital signatures. The full analysis (in German) is available at the following link: Artmann, J., Stroetmann, K., Giest, S.: In guter Gesellschaft. ÖKZ Das österreichische Gesundheitswesen.51. Jg., 10; 2010. "Europe is leading the rest of the world in advancing towards modern eHealth infrastructures and implementations" was the conclusion of Dr. Karl Stroetmann of empirica Consultants at an eHealth Strategies Symposium in Brussels. This is a field where Europe has achieved and even overachieved its Lisbon Strategy goals. Results of the Monitoring National eHealth Strategies study presented on Sept. 16, 2010 in Brussels, show that virtually all Member States of the European Union have either already begun or will begin shortly to undertake the implementation of national systems making basic patient data available to all healthcare professionals whenever and wherever needed. More than 100 high level political representatives from European Ministries of Health, representatives of stakeholder associations and European policy institutions attended the workshop which showcased several good practice cases of Member States eHealth strategies and highlighted the overall trends across Europe with regards to eHealth initiatives and implementation. While patient summary and Electronic Health Record (EHR)-like systems have already been high on the agenda for some time, most Member States (+16) now realise that there is an urgent need for (continuous) evaluation activities, both to better control policy progress and learn from challenges and experiences. Ilias Iakovidis, Deputy Head of the ICT-for-Health Unit of the European Commission, which ordered this survey, noted "Services high on the agenda are the electronic transfer of prescriptions and the provision of telehealth services for doctors and patients in remote regions or for chronically ill patients at home. These are among the key activities identified in our 2004 eHealth Action Plan. We are happy to see that the development of this Lead Market Initiative, which we have supported for many years, is gaining such momentum." Another indication of the strong political commitment at the national policy level is the growing establishment of permanent administrative support structures. National competence centres like Gematik, Germany's Society for Telematic Applications of the Health Card in Berlin; ASIP, France's Agence pour les Systèmes d' Information de santé Partagés in Paris; and THL, Finland's National Institute for Health and Welfare in Helsinki are increasingly used models of organisation. This support is further reflected by the initiation of the epSOS (Smart Open Services for European Patients) project by 12 Member States. The goal of this project is to establish interoperable cross-border services for the exchange of basic patient summary data and electronic prescriptions. "The European Parliament strongly supports this initiative and welcomes the fact that another 11 countries will soon join. We expect considerable benefits for all citizens in terms of the quality of health services they receive when abroad and in need of unplanned help", remarked Dr. Milan Cabrnoch, Member of the EP and its Committee on Employment and Social Affairs. Electronic Health Record (EHR) systems are a consistent element in almost all strategies and roadmaps. However, EHRs are usually not well defined, and they often (implicitly) refer only to a kind of patient summary or similarly brief or basic patient record. It is also becoming apparent that clinicians’ enthusiasm for comprehensive electronic health records, which may also connect patient data in diverse record systems at hospitals, community services etc., often relates more to perceived benefits on their immediate surroundings than to a geographically widespread sharing of patient data. Up until now, patients rarely have had access to their own medication profiles and the ability to reorder certain repeat medications themselves via the Internet. This access is expected to increase considerably in the coming years in those countries where it would be within the constraints of regulatory boundaries. The results of the Monitoring National eHealth Strategies study reveal that reaching agreements with regards to eHealth strategies and, to a greater extent, implementation of these strategies across Europe have proven to be much more complex and time-consuming than initially anticipated. In addition, the complexity of eHealth as a management challenge has been vastly underestimated. It is evident that further exchanges of information on national and regional experiences are needed; both in relation to successes and failures, and that these lessons learned may prove particularly beneficial to eHealth in Europe as a whole. Many challenges remain and there are many obstacles yet to be overcome: Issues of legality, semantic interoperability, standardisation and electronic identification domains must be resolved before these services can be regarded as truly Europe-wide and accessible to every citizen. Luc Nicolas from the Belgian Federal Public Health Services underlined that all Member States therefore "Strongly support the recently established eHealth Governance Initiative of European countries intended to tackle these and other issues at the highest political level." The symposium was kindly supported by the Belgian Government in the context of its Presidency of the EU. September 8th, 2010 - On Sept. 16, 2010 the European Commission and empirica, in cooperation with the Belgium Presidency of the EU, will present the final results of the eHealth Strategies study to a wider public. Commissioned by the EC in 2008, the eHealth Strategies study has surveyed the status-quo and assessed the progress made by EU Member States and EEA countries towards realising European eHealth Action Plan goals. The workshop will summarise key outcomes and feature presentations by representatives of national eHealth programmes on lessons learned from eHealth strategic planning and implementation. After a networking lunch and the presentation of good practice cases, policy recommendations for further eHealth diffusion will be discussed. The workshop is free of charge, but by invitation only. If you are interested in participating, please send a short note to Ms Uta Walossek (registration dot eHStrategies at empirica dot com) stating your specific interest, full name and affiliation. September 4th, 2009 - Dr. Rainer Thiel, research consultant with empirica, presented the eHealth Strategies study in his opening speech to the First Southeast European eHealth Networking Conference on September 4 in Sarajevo, Bosnia and Herzegovina. Hosted by the German GVG (Association for Social Security Policy and Research), the European Commission and the Bosnian Minister of Health, the conference was attended by some 50 delegates from twelve health ministries of the region. Discussions underlined that the aims and results of the eHealth Strategies study provide an influential guide and orientation for many countries to compare and foster their national eHealth initiatives, both in the EU and among its neighbours. Please feel free to download Dr. Thiel's presentation on the eHealth Strategies study. March 12th, 2009 - Dr. Karl Stroetmann, senior research associate with empirica presented the eHealth strategies study to the members of the i2010 subgroup on eHealth. The meeting was held on February 18th during the high-level eHealth conference in Prague. The i2010 subgroup is composed of representatives from the eHealth ministers of innovation and/or technology ministers. Their information about the project's objectives and methodological approach is key to facilitate the information gathering work carried out by national correspondents.